Faculty often lose class days due to university closure and/or delay during the first part of Spring semester. Students enrolled in a first-half of spring semester course are most often impacted. When classes are cancelled right before an exam or major project, you might consider providing an alternative activity to keep students on track for success. Please join us for Engaging Students on Snow Days sponsored by The Teaching and Learning Center. This low-technology workshop will include tips from faculty on Snow Day preparation, communicating expectations to students, and ideas for an alternative lesson plan with student engagement in mind. We will discuss both asynchronous and live, synchronous activity ideas. Resources and handouts on technologies available at Wake Forest will be provided. Register for this and other “snow day” themed workshops on the PDC Website. The goal of the Snow Day Technology portal is to rebrand technology tools during the winter months, curated for their ease of use, support availability, and adaptability for shifting instruction outside of the classroom. 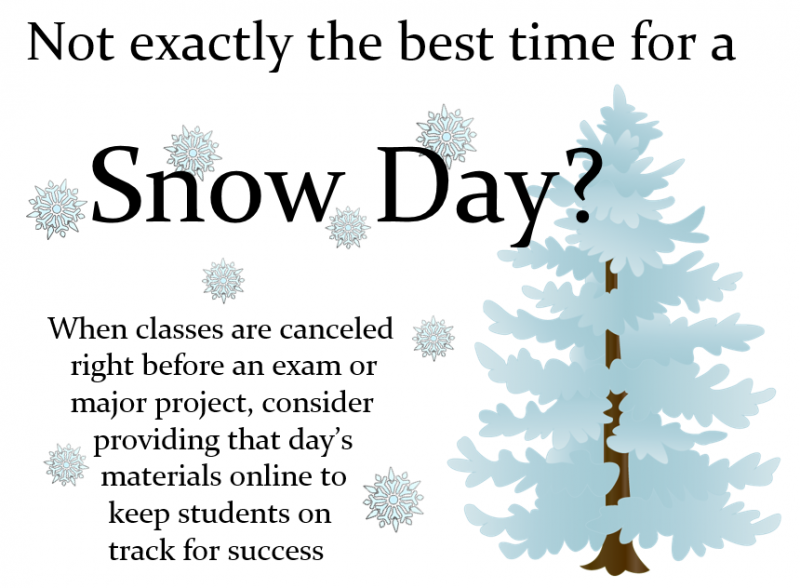 Faculty who may benefit from Snow Day Technologies are those teaching a first half of the spring semester class, losing class days to university closure at the end of their semester. Faculty who wish to keep students on pace for success before a midterm exam may also find value in helping students prepare for an exam after the inconvenience of multiple lost class days. Tools and methods support both asynchronous (most popular) and live, synchronous learning. Visit go.wfu.edu/SnowDayTech for a list of technologies. apps, classroom, Faculty, Flipped Classroom, online learning, Sakai, Snow Day, teaching, technology, training, VoiceThread, WebEx. Bookmark.